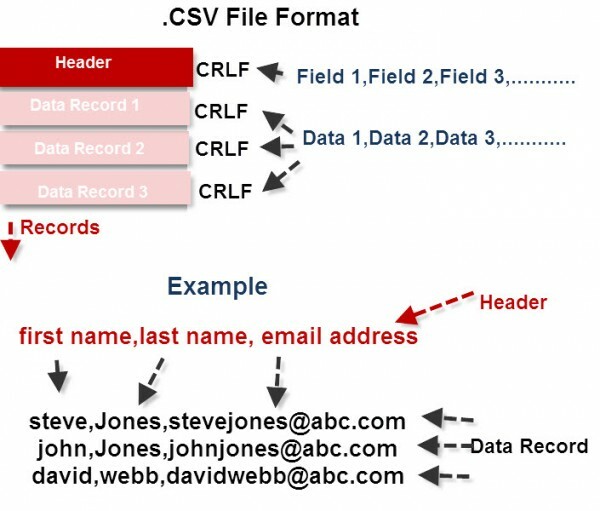 CSV (comma separated values) is a common data exchange format that is widely supported on computer systems. Data exchange is accomplished by exporting to a .csv file on one system and importing from a csv file on the other system. A comma-separated values (CSV) file stores tabular data (numbers and text) in plain text. Each line of the file is a data record. CSV files can be used for transferring different types of data from different applications, and it is commonly used for transferring email addresses (contacts) from one email system to another. The first line of a .csv file contains the header. The header consists of a number of fields that describe the data. Each field is separated by a comma. The use of the comma as separator is what give the file its name (comma separated values) or CSV. Subsequent lines contain the data records that should match the header. That is, if the header has an email field in the third position, then the data records should have an email field in the third position. Each field of the data record is again separated by a comma. A carriage return line feed combination (CRLF) is used to separate records. This is shown in the diagram below. The header record consists of a series of fields separated by a comma. The name of these fields isn’t fixed but chosen by the application developer. However, in the case of email there are a large number of common/similar field names in use. When you export email contacts from an email program like outlook Express the header file that is generated will be of a standard format for outlook express. When you export email contacts from an email program like Yahoo Mail the header file that is generated will be of a standard format for Yahoo Mail. When you import contacts into an email program like outlook Express then outlook express expects the contacts to be in a particular format. Importantly the header field names must match the header field names expected by outlook express. If the header field names in the .csv files aren’t recognized by the import program then you will get an error,or the field will be ignored. For example, if the .csv file contains an header field called emailaddress, but the import program expects a name of mailaddress, then you will get an error, or the field will be ignored. Most import utilities provided by email providers will support a variety of header file formats. For example, although the output format from Yahoo is different than that of outlook express. the outlook express file imports correctly into Yahoo Mail. This is because the import program of Yahoo mail recognizes the header file format generated by outlook express. If it didn’t then you would need to adjust the header field names. When testing importsThe easiest method is to reduce the csv file to a single data field entry. You can use any text editor like notepad to edit .csv files but the easiest tool is a spreadsheet program like Microsoft excel. When you import a .csv file into excel then the fields are split into columns and are easily edited. Here is a video that takes you through the points covered above. When exporting and importing email contacts from one email system to another then you should be aware that they may use different field names to describe their data. If you encounter errors then you may need to adjust the header field names to match the field names expected by the import program.